In 63 years my feet have suffered blisters, corns, bunions, plantar fasciitis and arthritis in feet and toes. Pain from banging sore toes on the ends of a conventional (and well named) ‘toe box’, and rigid soles recently limited my walking. And I was paying around $125 USD per pair for extra wide New Balance shoes seeking toe-room and padding for arthritic bumps. But nothing worked because the entire idea of footwear with stiff, unbending sole and upper is literally ‘unnatural’. The foot evolved to turn, twist, bend, stretch and feel the earth- which the foot can’t do if it’s in a box. 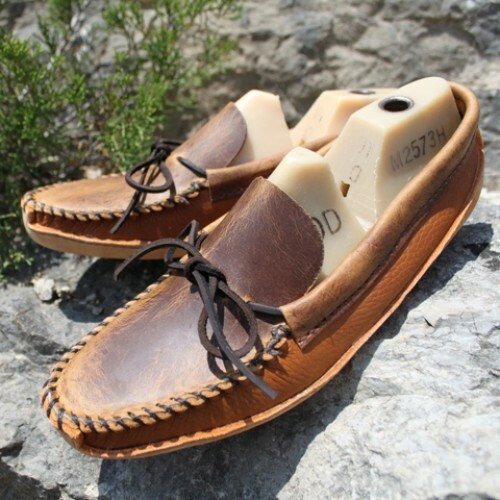 After an extensive web search I found these ‘canoe’ style moccasins at Kings Trail Leather. The owners Claude and Susan talked with me to determine my needs and called back to make sure they were right. And they are right. As soon as I put them on I thought I might never take them off again. These are my daily house shoes and they have worn very well over the months. I had Claude make them of his recommended very soft brown leather, cut for use with socks- but found in summer I more often went without socks. So I ordered this ‘batwing’ style moccasin in the same very soft brown leather as the first pair but sized tighter for sock-less wear. These use bullhide for the sole and feel just as fabulous on my feet. BTW, companies that make cowhide or bullhide-soled shoes make you aware of the danger of slipping on wet surfaces, the main drawback to animal hide on the bottom. And DON’T pedal your bike in hide-soled shoes! My pedals are pretty flat but still left dents in the leather after only a short ride. Nevertheless I wanted hide soles because I also wanted to try earthing or grounding. I’m still unsure of earthing but the 100% flat sole, heel and footbed, 100% leather construction and lack of padding are what I need. Not many firms make leather shoes with leather soles but Softstar Shoes does and they feel just as wonderful on my feet. 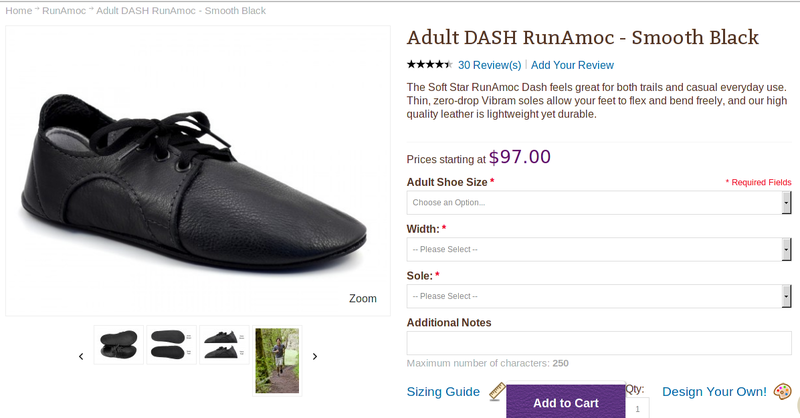 I bought these Runamoc soft leather shoes, also with heavy bullhide sole. I can wear them for hours in complete comfort as though I’m wearing only socks. 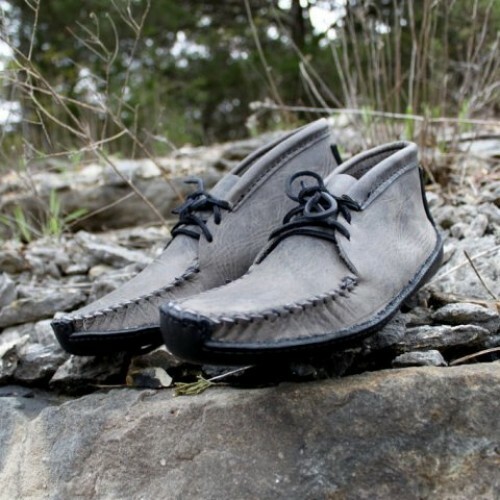 But again these are for dry weather only because the soles would soak through in the damp and slip on mud and leaves. I needed a pair with tougher, waterproof soles and I needed them quickly because moccasins and ‘elf shoes’ felt so good I had thrown away most of my old rigid shoes! Softstar had a sale on the Portlander shoe in brown with thin Vibrum (TM) soles for wet weather. I bought their Bee brand wax/oil water-proofer and both help keep the water out nicely. They recommend you buy the Portlander one size larger than normal so I bought a size 12 instead of 11 and they were right, they’re a perfect fit, not an easy thing on the web. The grippy synthetic bottoms don’t track in much dirt but work well on trails and are as thin and flexible as cow or bullhide helping agility immensely. These shoes don’t allow you to pound your feet and your joints will thank you for it. Of course the leather is thinner than conventional shoe material so these ‘new [old] age’ shoes may not last as long as petrochemical shoes, ugly as sin and out-gassing toxic Volatile Organic Compounds for life (ever notice how they smell?). But these feel so good I’m thinking about buying another pair and throwing away my last pair of conventional shoes.